Stats! Small dragons are fodder or worthy foes, medium and large ones serve as bosses, and gargantuan wyrms boss the bosses – and optional rules let the GM who likes TPKs go even bigger. Rules for dragon's breath, whether in clouds or in cones, be it acid, cold, fire, lightning, poison, or something more exotic (like slime or pure disintegration). Guidelines for adding special abilities to make your dragons more memorable . . . and more challenging. 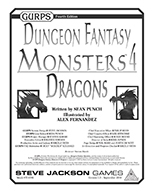 Advice on using dragons in the game, with an emphasis on making them scary in combat. Four ready-to-use dragons that illustrate how to customize generic monsters into unique encounters your players won't soon forget. Because sometimes the heroes need to be picked on by something their own size! 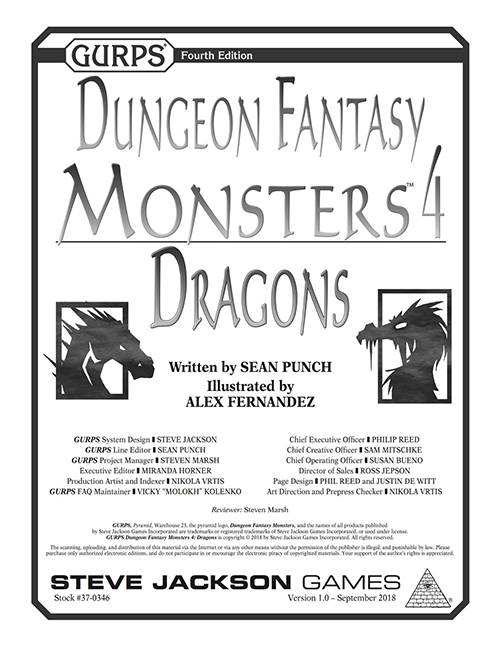 For an adventure where dragons shine, check out GURPS Dungeon Fantasy Adventure 2: Tomb of the Dragon King.